Good gun for my collection. Fast delivery in perfect condition. My gun came very quickly to my local FFL. The gun is a monster and I can't wait to take it to the range. This is a well crafted gun as Smith & Wesson's are but there are 2 things I don't like about it and that is the reason for only 4 stars. The first & main reason is the grip. It is very cheap in my opinion. It sounds & feels hollow when you grip it. It doesn't give a good solid feel when in our hand. Yes I know grips can be replaced but this is a $1000 dollar gun. I should not have to replace them to have a solid feel in my hand right out of the box. The second thing I don't like about it is the all black front blade site. It's very hard for me to see when it is 8.375 inches away from the rear site. It is impossible to see when aiming at something dark in color.. This is nothing a little paint or finger nail polish won't cure BUT... Again it's a $1000 dollar gun. I should be able to see the sights right out of the box when aiming at anything. Not just florescent targets. The only reason I gave this gun 4 stars instead of 3 is because of what it is and what it fires out of the barrel. If this would have been a S&W 686 or .38 it would have received only 3 start. With all that said I'd still buy it again. Here it is next to a Bic pen to give you an idea of size. S&W 500 was very accurate out of the box. Just needs larger grops. Fast shipping. Customer service was very good. It's exactly what you expect it to be: the biggest, heaviest, most powerful (probably) revolver you've ever owned. My example works fine and brought a smile to my face the moment I saw how big the CASE it comes in is. It's big and very heavy, but you know that going in. I have to say though, the finish is among the worst I've ever seen on a stainless gun. Lots of visible sanding and work marks in the right light. Still, not a big enough deal to me to return it. I intend to take it afield quite a lot anyway. Ment for hunting. Not a carry. The idiot who left the first review has no idea wtf he is talking about. dry firing any smith center fire revolver will not hurt it. The first review was done by an idiot. you can't hurt a smith center fire revolver by dry firing. If you want a accurate 500 mag go for this but if you are used to a 6 shooter you might just brake the firing mechanism if dry fired 10 times. BUT if you are a military personnel do not get this gun you think you have another shot but you don't! 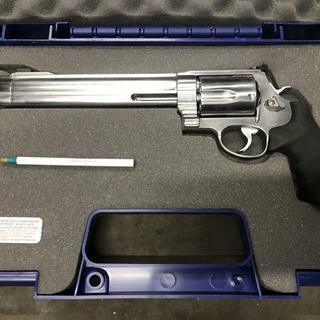 You can acquire this Smith and Wesson 500 500SW Magnum 8.375 inch 5 shot at quite an affordable price today. It is one of the most powerful production revolvers in the world. For ultimate power and velocity there's nothing even close to an X-Frame model handgun. Made in the USA. The gun basically works on both single and double action modes. Its Front Sight is composed of black ramp and its rear sight is adjustable.It has an overall length of 21.5 inches,weighs 5.5 lbs and has a strong synthetic grip. Its frame is made of stainless steel and a cylinder material which works towards rust control. Suitable for hunting. Don't miss your chance to own the Smith and Wesson 500 500SW Magnum 8.375 inch 5 shot from grabagun today.